Good Morning Friends!! How was your week? Mine was super hectic, burning the midnight oil so to speak to get my monthly club projects ready for the weekend. I have my Saturday morning club and Monday evening club. Both are going well and I’m always willing to start a new club if we can get 5-6 new stampers together. Contact me if you want to get a group going. It’s a lot of fun! (Right club ladies… chime in here in the comments below). Since this is the last month that we’ll have Sale-a-bration opportunities to earn free products, I really wanted to make sure my stamping friends could try even more product out. My line up this month is featuring many punches, new Designer Series Paper, and of course new stamp sets. Please let me know if you would like any “ingredients” for any of these cards. Feel free to ask a question here on this blog page or email me for more info. 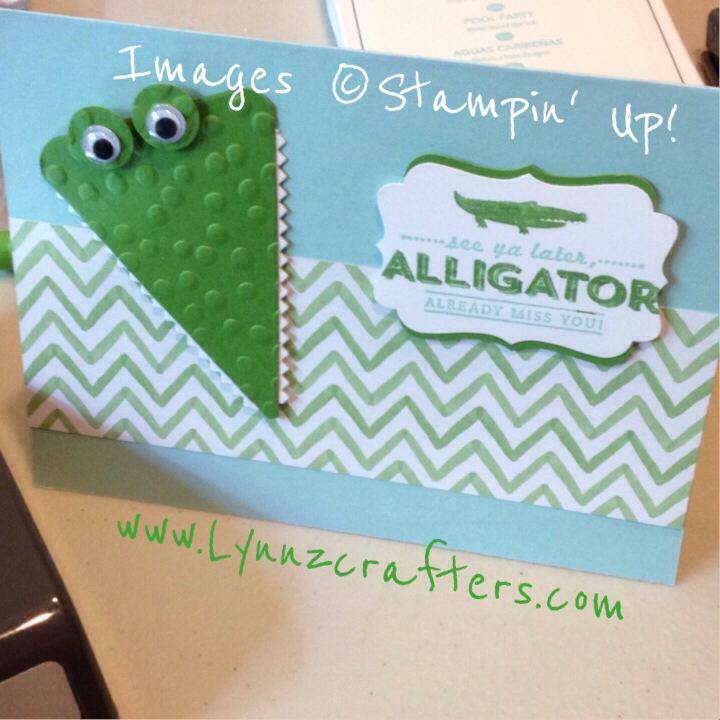 When I first saw the alligators popping up all over Pinterest, I knew I needed to make one. 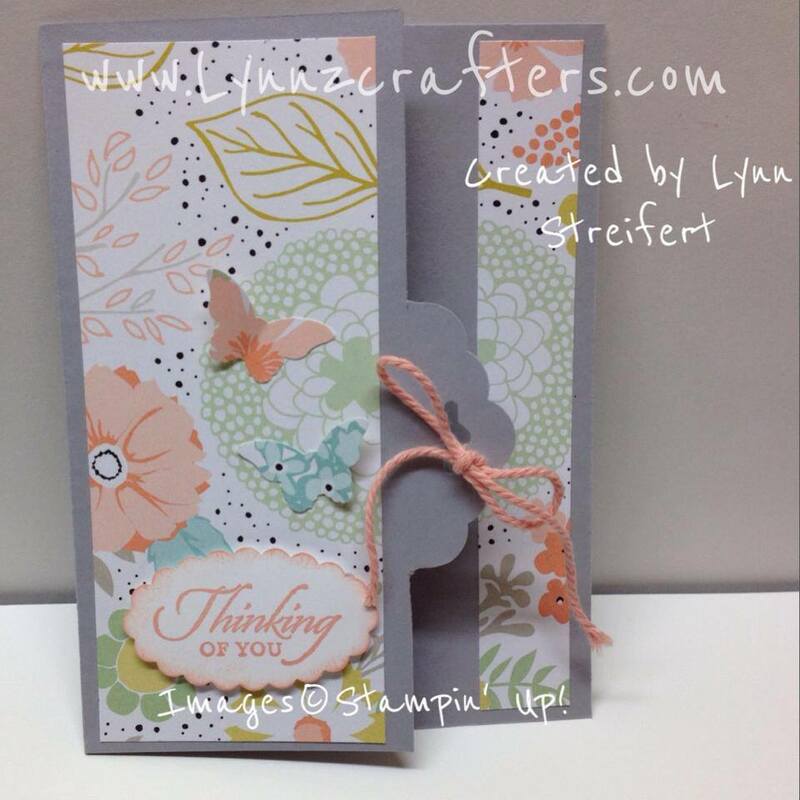 This one is a case (copy and share everything) card from a fellow demonstrator named Jennifer T. she is an Artisan award winner and does beautiful work. I modified it a little bit with the paper and supplies I had on hand. This card was created out of a mistake, don’t you love it when you make a mistake and you like what you fixed better anyway?? This card features our Sale-a-bration DSP called Sweet Sorbet and is my absolute favorite thing from SAB this year. It is so pretty and fun to work with. I needed a St. Patrick’s Day card and thought my club ladies would appreciate this soft watercolor wonder paper as a background. 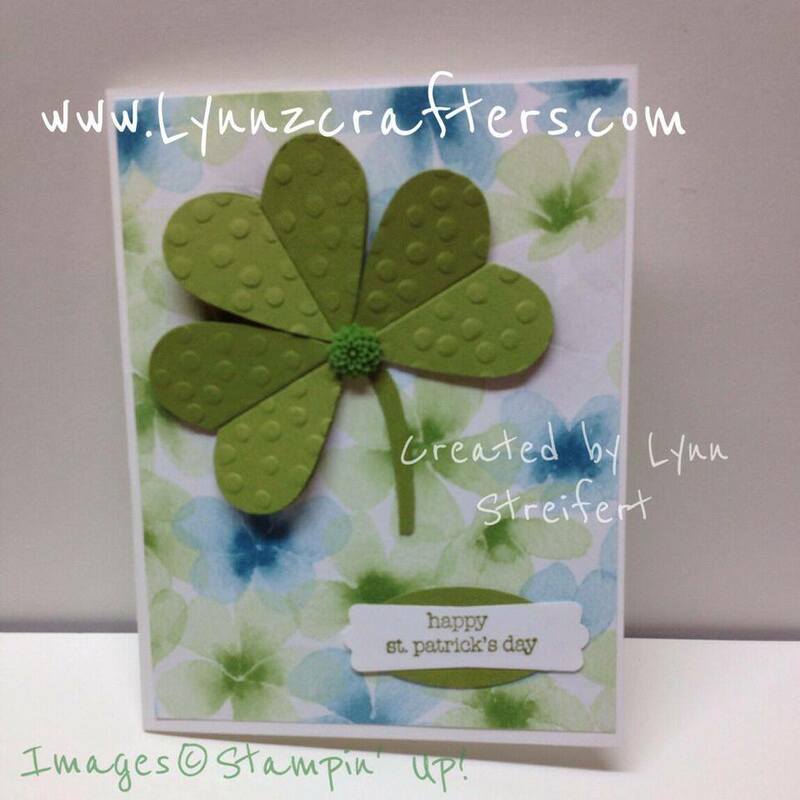 I had made a card with 4 leaf clover a few years ago and I just modified that one for this idea. It’s the full heart punch (make 6 of them) score in 1/2 and run all through the Decorative Dots Textured embossing folder, available only for Sale-a-bration! 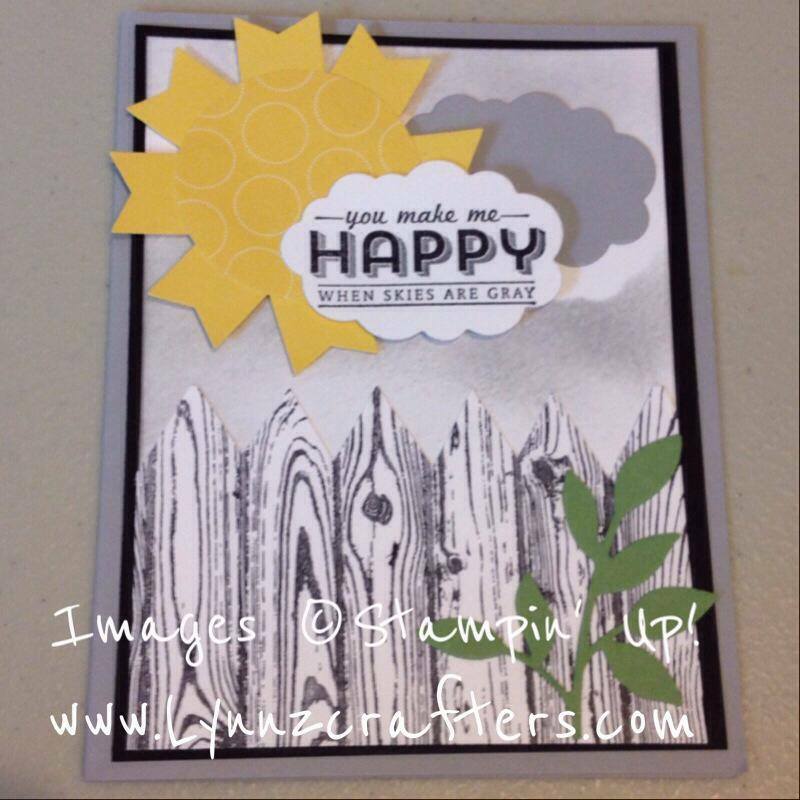 This card is a bit more advanced but I knew I wanted to use another Sale-a-bration stamp from See You Later Alligator stamp set, and I thought “You Make Me Happy When Skies Are Grey” was a perfect sentiment to put on a Smoky Slate card. I went on pinterest and found Sandy H’s awesome card and had to case it. I can picture adding flowers to the vine, in front of the fence, and even adding a rainbow to spice this card up some more. But suffice to say, this is a lot of steps. But my club ladies are worth it. Four cards this month, no 3 D items this time… next month will have Easter and of course other cards and projects featuring more new product from the Occasions Catalog. Won’t you please leave me a comment, let me know which card is your favorite? 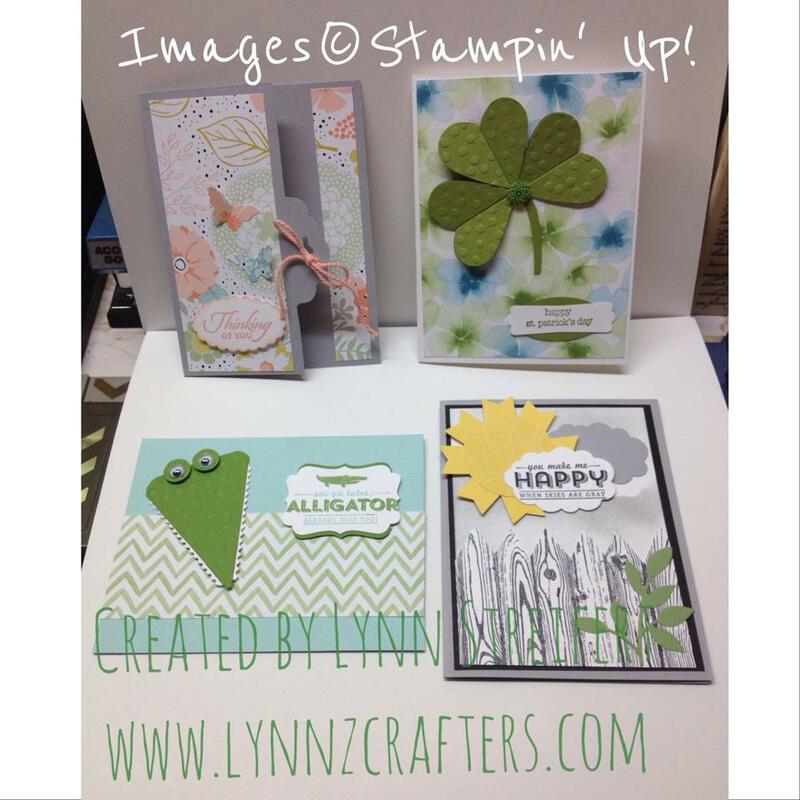 And comment if you’d like more info about joining a monthly stamping club. Oh Amye, thank you so much for your comment, your enthusiasm, and support! I love stamping with you!